For other uses, see Mirepoix (disambiguation). A mirepoix (/mɪərˈpwɑː/ meer-PWAH; French pronunciation: ​[miʁˈpwa]) is a flavour base made from diced vegetables that are cooked, usually with butter, oil, or other fat, for a long time on a low heat without colour or browning. It is not sautéed or otherwise hard cooked because the intention is to sweeten the ingredients rather than caramelise them. It is a long-standing cooking technique in French cuisine. Further cooking, often with the addition of tomato purée, creates a darkened brown mixture called pincage (French: pinçage). When the mirepoix is not precooked, the constituent vegetables may be cut to a larger size, depending on the overall cooking time for the dish. Usually the vegetable mixture is onions, carrots, and celery (either common pascal celery or celeriac), with the traditional ratio being 2:1:1, two parts onion, one part carrot, and one part celery. Mirepoix is the flavour base for a wide variety of Western dishes: stocks, soups, stews and sauces. Similar flavour bases include the Italian soffritto, the Spanish sofrito, refogado/sufrito (braised onions, garlic and tomato) from Portuguese-speaking nations, the German Suppengrün (leeks, carrots and celeriac), the Polish włoszczyzna (leeks, carrots, celery root and parsley root), the Russian/Ukrainian smazhennya or zazharka (onion, carrot and possibly celery, beets or pepper), the US Cajun / Creole holy trinity (onions, celery and bell peppers), and possibly the French duxelles (mushrooms and often onion or shallot and herbs, reduced to a paste). The term is not encountered regularly in French culinary texts until the 19th century, so it is difficult to know what a dish à la mirepoix was like in 18th-century France. Antoine Beauvilliers, for instance, in 1814, gives a short recipe for a Sauce à la Mirepoix which is a buttery, wine-laced stock garnished with an aromatic mixture of carrots, onions, and a bouquet garni. [full citation needed] Marie-Antoine Carême, in the 1830s, gives a similar recipe, calling it simply "Mire-poix". [full citation needed] By the mid-19th century, Jules Gouffé refers to a mirepoix as "a term in use for such a long time that I do not hesitate to use it here". [full citation needed] His mirepoix is listed among essences and, indeed, is a meaty concoction (laced with two bottles of Madeira), which, like all other essences, was used to enrich many a classic sauce. By the end of the 19th century, the mirepoix had taken on its modern meaning. Joseph Favre, in his Dictionnaire universel de cuisine (circa 1895, reprinted 1978), uses the term to describe a mixture of ham, carrots, onions, and herbs used as an aromatic condiment when making sauces or braising meat. The matignon is very similar to the mirepoix, except that the matignon is designed to be brought to the table and eaten with the dish or alone as a side dish. According to the 1938 Larousse Gastronomique, a mirepoix may be prepared "au gras" (with meat) or "au maigre" ("lean"). Mirepoix au maigre is sometimes called a brunoise (though strictly speaking this term more accurately merely designates the technique of cutting into small dice with a knife). A mirepoix au gras contains diced ham or pork belly as an additional ingredient. Similar combinations, both in and out of the French culinary repertoire, may include leeks, parsnips, garlic, tomatoes, shallots, mushrooms, bell peppers, chilies, and ginger, according to the requirements of the regional cuisine or the instructions of the particular chef or recipe. The analogous soffritto (frequently containing parsley) is the basis for many traditional dishes in classic Italian cuisine, and the sofrito serves a similar purpose in Spanish cuisines. In Cajun and Creole cuisine, a mirepoix or (jocularly so-called) "holy trinity" is a combination of onions, celery, and bell peppers. Traditionally, the weight ratio for mirepoix is 2:1:1 of onions, celery, and carrots; the ratio for bones to mirepoix for stock is 10:1. When making a white stock, or fond blanc, parsnips are used instead of carrots to maintain the pale color. Suppengrün [ˈzʊpm̩ˌɡʁyːn] means soup greens in German, and the Dutch equivalent is soepgroente. Soup greens usually come in a bundle and consists of a leek, a carrot, and a piece of celeriac. It may also contain parsley, thyme, celery leaves, rutabaga (swede), parsley root, and onions. The mix depends on regional traditions, as well as individual recipes. The vegetables used are cold-climate roots and bulbs with long shelf lives. Suppengrün act as herbs and impart hearty, strong flavors to the soup or sauce, providing a foil for other strong tasting ingredients such as dried peas and beans or pot roast. Large chunks of vegetables are slow cooked to make flavorful soups and stocks, and are discarded when the vegetables have given up most of their flavor. Finely chopped suppengrün are browned in fat and used as a basis for a finished sauce. The vegetables may also be cooked long enough until they fall apart, and may become part of the sauce or pureed to form the sauce. In Italian cuisine, chopped onions, carrots and celery is battuto, and then, slowly cooked in olive oil, becomes soffritto. It is used as the base for most pasta sauces, such as arrabbiata sauce, but occasionally it can be used as the base of other dishes, such as sauteed vegetables. For this reason, it is a fundamental component in Italian cuisine. It may also contain garlic, shallot, or leek. According to the Italian restaurateur Benedetta Vitali, soffritto means "underfried" and describes it as "a preparation of lightly browned minced vegetables, not a dish by itself." At one time it was called "false ragout", because soffritto was thought to vaguely recall the flavor of meat sauce. A typical set of soup greens, known as włoszczyzna, used in Polish cuisine: carrots, parsley root and leaves, leek, and celeriac. Bay leaves and allspice grains are also shown. Włoszczyzna [vwɔʂˈt͡ʂɨzna] is the Polish word for soup vegetables or greens. The word literally means "Italian stuff" because Queen Bona Sforza, who was Italian and married Polish King Sigismund I the Old in 1518, introduced this concept to Polish cuisine. 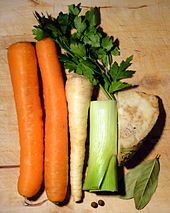 A włoszczyzna may consist of carrots, parsnips or parsley root, celery root or celeriac, leeks, and savoy or white cabbage leaves, and sometimes celery leaves and flat-leaf parsley. The most typical, packaged combination is celery root, parsley root, carrots, and leeks. Włoszczyzna is usually cut up to uniform size and boiled to form a flavour base for soups and stews. ^ Vitaux, Jean. "Peut-on écrire l'histoire de la gastronomie?". canalacademie.com (in French). ^ "Petit lexique culinaire". chefsimon.com (in French). Archived from the original on 2007-01-18. ^ French Wikipedia: Maison de Lévis. ^ French cuisine §Food establishments §History. ^ a b Alan Davidson, Oxford Companion to Food (Oxford: Oxford University Press, 1999), p. 509. ^ Since the 17th century, recipe books in France had been organized so readers could plan meals in accordance with prescribed days for fasting according to the Roman Catholic liturgical calendar. See Sean Takats, The Expert Cook in Enlightenment France (Baltimore, Maryland: Johns Hopkins University Press) p. 110. ^ Larousse Gastronomique, Montagné, Prosper, and Gottschalk, eds., introduction by A. Escoffier and Philéas Gilbert (Paris: Librerie Larousse, 1938), p. 690. ^ The 1938 Larousse (op. cit) recommends the addition of thyme and powdered bay leaf to the mirepoix au maigre, for example. ^ "Use Carrots, Onions and Leeks for German Soup Greens". ^ "Onions, Carrot and Celery". www.italiana.co.uk. Retrieved 13 October 2018. ^ "The Secret Weapon in Italian Cooking". tastingtable.com. 5 July 2016. Retrieved 13 October 2018. ^ Eats, Serious. "All About Mirepoix, Sofrito, Battuto, and Other Humble Beginnings". www.seriouseats.com. Retrieved 13 October 2018. ^ "Marinara Sauce - Soffritto Style". CookingWineandTravel.com. Retrieved 13 October 2018. ^ "Chef Jerry Corso Gets Cooking with Soffritto". seattlemag.com. 15 March 2016. Retrieved 13 October 2018. ^ Benedetta Vitali, Soffritto: Tradition and Innovation in Tuscan Cooking (Berkeley, Toronto: Ten Speed Press, 2001), pp. 7–8.